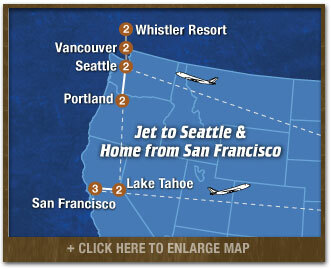 Jet to SEATTLE... Stroll through fabulous Pike Place Market (watch out for flying fish! ), visit the original Starbucks, then take the Monorail to Seattle Center, home of the outrageous Experience Music Project. You can play, listen and learn music from early Rock 'n Roll to the latest trends. You’ll learn the history of this fascinating city on our Underground Seattle Tour. At night we’ll play action-packed Whirlyball, an awesome combination of bumper cars, basketball and lacrosse! 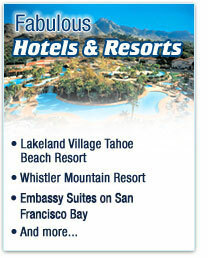 WHISTLER RESORT ACTION CENTER... Want to go Summertime Skiing or Snowboarding in July? Blackcomb Mountain offers both! You can also go Mountain Biking, play Tennis, or just soak up the sun at this great resort. VANCOUVER... Visit the Stanley Park Aquarium, then have a great meal at the incredible marketplace on Granville Island. Crossing the Suspension Bridge, 230 feet over Capilano Canyon is a once-in-a-lifetime thrill! At night, it's side-splitting comedy at the TheatreSports Improv. PORTLAND... Another day of Cascade mountain excitement at fabulous Mt. Hood! How about the Giant Alpine Slide and Zip Line at the Skibowl Summer Action Park? 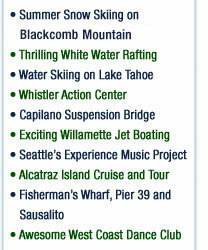 We end our stay in the Pacific Northwest with incredible Jet Boating on the Willamette River...an ATW exclusive! Jet to LAKE TAHOE... Spectacular Lakefront Resort...It's condo-living for you and your friends...cook up your own breakfast and dinner. Try Water Skiing, with professional instruction, or tubing, kneeboarding, wakeboarding, stand-up paddleboarding, kayaking on this fabulous lake. Relax on the beach, play beach volleyball, swim the beautiful blue waters. At night it’s Magic Carpet Mini Golf. WHITEWATER RAFT TRIP... Shoot the rapids on a great professionally-guided rafting adventure on the American River. This leads up to one of the most exciting and fun-filled stops on your trip. SAN FRANCISCO... We'll check in to the beautiful Hyatt Regency Burlingame on San Francisco Bay. Walk down Lombard Street, the world's crookedest, grab a bite at Pier 39 or Fisherman's Wharf, then dessert at Ghirardelli Square. We'll take in a Giants' or A's night baseball game. Have dinner at the Hard Rock Café and take a Night Cruise and Tour of Alcatraz Island ($36 value). Walk across the Golden Gate Bridge to explore the charming Sausalito waterfront, take a cable car to a Chinatown banquet, and a night of dancing at our cool West Coast Dance Club! Next day we pack our bags and fly home with great memories and new found friends!